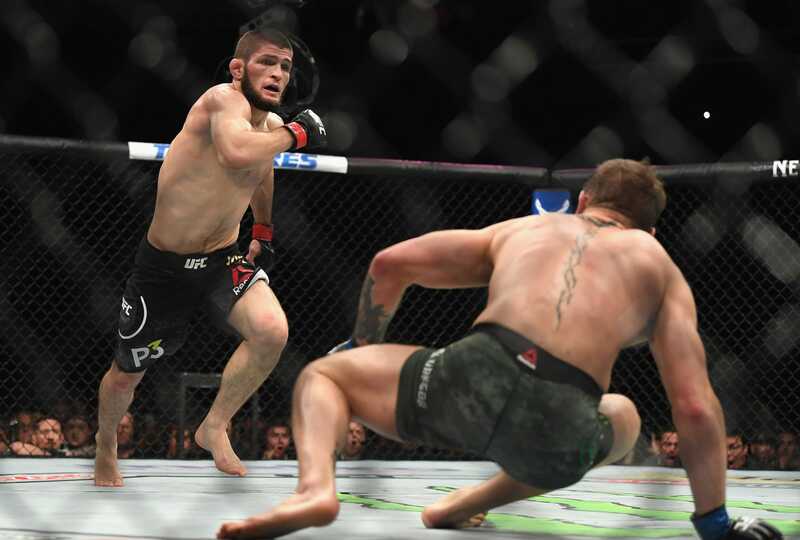 Photo by Harry How/Getty ImagesKhabib Nurmagomedov dropped Conor McGregor with a thudding overhand right in the second round of their UFC 229 fight. Khabib Nurmagomedov can do something no fighter has ever been able to fully do before, according to his manager Ali Abdelaziz. Abdelaziz believes Nurmagomedov has the necessary power to drop Mayweather with a single punch. Nurmagomedov is one of the biggest names in combat sports right now after his stunning fourth round submission win over Conor McGregor at UFC 229. A fight between him and Floyd Mayweather has been talked up of late, and is something Mayweather himself is eager to deliver. But Abdelaziz believes it could be something Mayweather may regret. Khabib Nurmagomedov has the power to do what no professional fighter has properly been able to do before – punch Floyd Mayweather so hard he collapses to the canvas. That’s according to Ali Abdelaziz, Nurmagomedov’s manager, who was asked about a boxing rules contest against the undefeated American in a recent interview with ESPN journalist Brett Okamoto. A rumoured bout between the UFC lightweight world champion Nurmagomedov and former five-weight boxing king Mayweather is only a recent phenomenon, and largely a consequence of Nurmagomedov’s new-found fame in combat sports. Nurmagomedov stunned the sports world when he submitted Conor McGregor in the fourth round of a wildly entertaining UFC 229 event on October 6. His infamy grew when he refused to celebrate the win and instead mounted the octagon fence to charge at McGregor’s cageside friend Dillon Danis, inciting brawls in and out of the octagon. Nurmagomedov – who frequently calls himself “the Floyd Mayweather of MMA”– dropped McGregor with a thudding overhand right punch in the middle of the UFC 229 fight, one year after Mayweather stopped McGregor on his feet in 2017. Nurmagomedov’s manager believes this is evidence of a clear difference in power between the two athletes, something that will be in his fighter’s favour should they ever trade blows. Nurmagomedov has mostly campaigned as an MMA lightweight in recent years, which means he has to weigh in at 155 pounds. Previously, he fought at welterweight, where he would frequently fight as heavy as 170 pounds. Mayweather, in his latter years as a prizefighter, would seldom weigh heavier than 154 pounds – and Abdelaziz believes this would be another factor in any bout between the two. 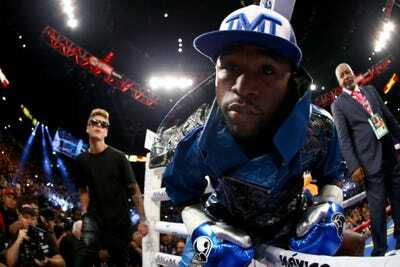 Photo by Al Bello/Getty ImagesFloyd Mayweather has rarely been troubled by an opponent’s punching power. Mayweather, of course, has never properly been knocked down in his entire 50-fight professional career. But that is not to say he hasn’t come close to kissing the canvas. When he fought Zab Judah in 2006 his glove touched the ground after a swift Judah right hook, but this was regarded as a slip by the referee at the time. And when he boxed Carlos Hernandez in 2001 he knelt on the canvas to receive a standing-eight count, but this was a tactical move to buy himself some time after he injured his own hand, rather than a result of Hernandez’s punching power. Abdelaziz seemingly believes Nurmagomedov can go one step further than Judah or Hernandez and put Mayweather’s entire body on the floor with a single shot. Abdelaziz’s interview follows Mayweather’s statement to TMZ Sports on Thursday that he “absolutely” is “fighting” Nurmagomedov. Nurmagomedov’s fight with McGregor was the best-selling UFC pay-per-view show of all time with 2.4 million sales in the US television market alone. Mayweather, meanwhile, has been involved in four of the top five best-selling PPV shows of all-time.